The BusyCal Inbox displays notifications of meeting invites or changes to existing events. You can accept / decline or ignore (delete) notifications directly from the Inbox. Both the app icon and the Inbox will display a badge indicating the number of notifications in your inbox. Click on the inbox icon in the toolbar to see the notifications and dismiss them. When an attendee receives an invitation, BusyCal will display an Inbox notification in the top left corner of the window. Clicking on the inbox icon will allow the attendee to Accept or Decline the meeting request, at which point a reply will be sent to the meeting organizer with their status. Likewise, meeting Organizers will receive attendee replies in their inbox. For more info see Meetings. Click on the Inbox icon in the top left of the window to show the notifications. Click on a notification to select it without clicking the Accept or Decline button. Press the Delete key on your keyboard to delete the notification from the inbox. The meeting will remain intact in your calendar, but no response will be sent to the meeting organizer. In addition to notifications of meeting requests in BusyCal, you can optionally show notifications of changes made to events in BusyCal or contacts in BusyContacts. For example, when sharing calendars with others, a notification can be displayed in BusyCal when an event on a shared calendar is edited by someone else. You can enable change notifications on a per-calendar basis. 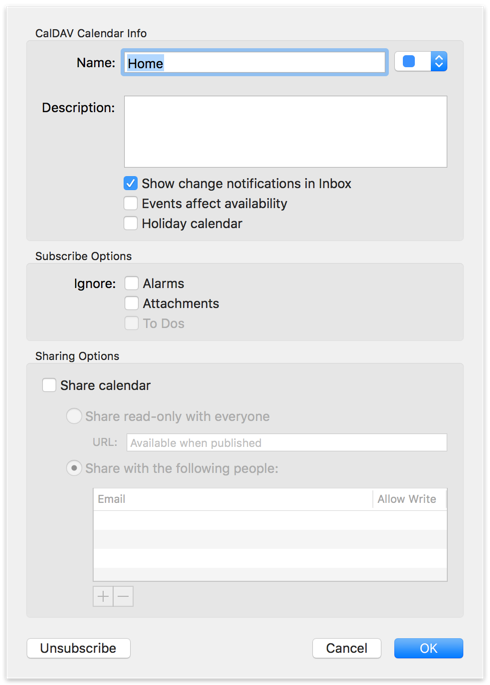 To do so, open the Calendar Info dialog by double-clicking a calendar name in the sidebar or Control-clicking a calendar and choosing Get Info from the contextual menu. Then check Show change notifications in Inbox. If you have dozens or hundreds of notifications in your Inbox, you can acknowledge all of them at once by holding down the Option-key and clicking OK All. Also, you can delete all meeting notifications by selecting one of the notifications, then holding down the Option-key and pressing the Delete key.